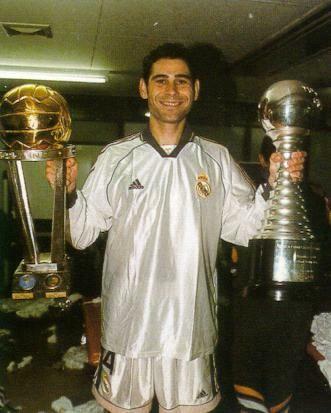 The 1998 Intercontinental Cup was a football match played on 1 December 1998 between Real Madrid, winners of the 1997–98 UEFA Champions League, and Vasco da Gama, winners of the 1998 Copa Libertadores. The match was played at a neutral venue, the National Stadium in Tokyo, in front of 51,514 fans. Real Madrid forward Raúl was named as man of the match. Roberto Carlos joined Real Madrid in the year 1996 close season, where he was given the number 3 shirt and held the position as the team’s first choice left-back from the 1996–97 season until the 2006–07 season. 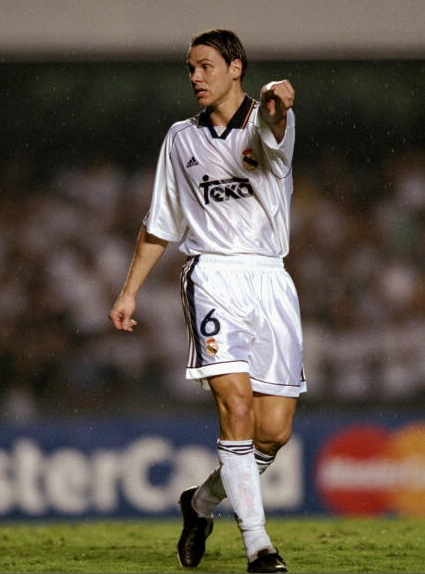 During his 11 seasons with Madrid, he appeared in 584 matches in all competitions, scoring 71 goals. 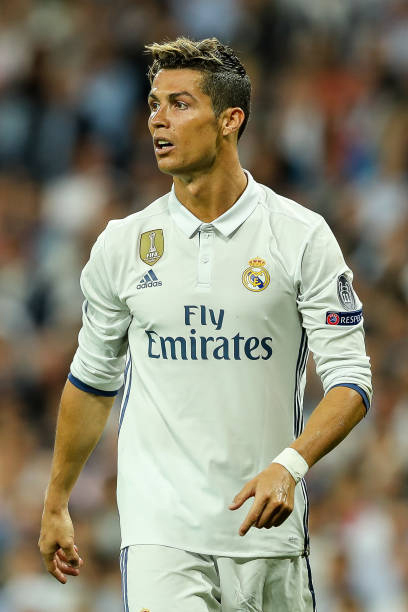 He is Real Madrid’s most capped foreign-born player in La Liga with 370 appearances, after breaking the previous record of 329 held by Alfredo Di Stéfano in January 2006. 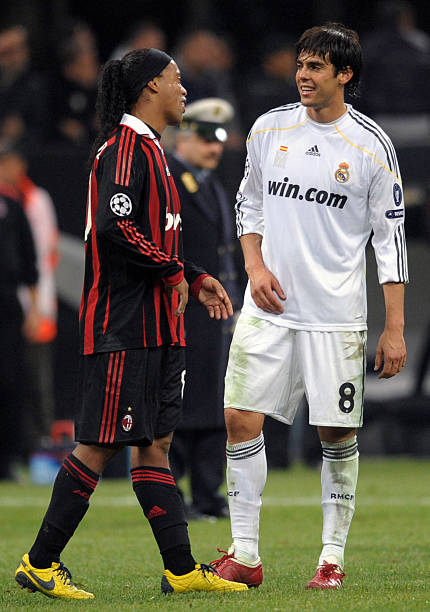 During his Real Madrid career, Roberto Carlos was, alongside Milan and Italy legend Paolo Maldini, considered the greatest left-back in the world. As a high-profile player and one of the most influential members of the team, Roberto Carlos was considered one of Madrid’s Galácticos during Florentino Pérez’s first tenure as club president. 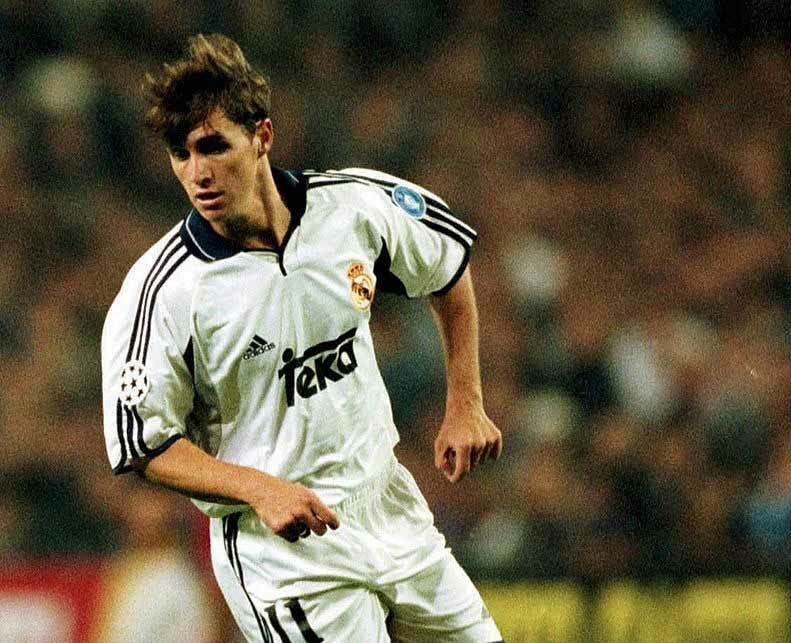 He won four La Liga titles with Madrid, and played in the 1998, 2000 and 2002 UEFA Champions League finals, assisting Zinedine Zidane’s winning goal in 2002, considered one of the greatest goals in Champions League history. Roberto Carlos was named as Club Defender of the Year and included in the UEFA Team of the Year in 2002 and 2003. 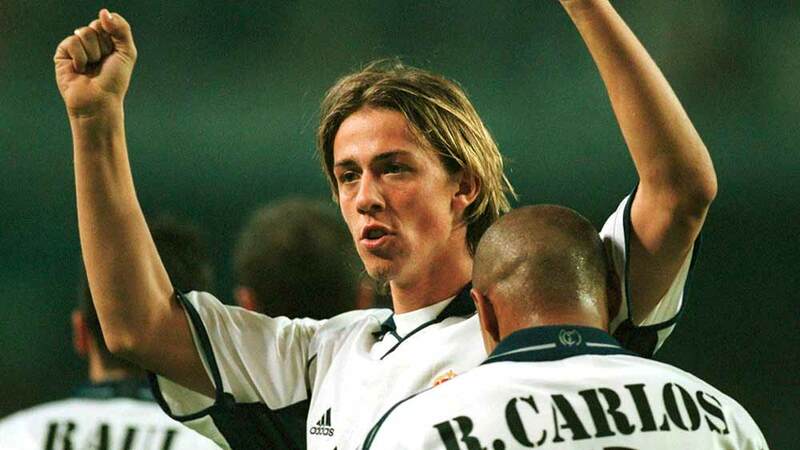 In the later part of his Real Madrid career, Carlos was named as one of the club’s “three captains” alongside Raúl and Guti. Renowned for getting forward from his left-back position and scoring spectacular goals, in February 1998, he scored arguably his most memorable goal for Real Madrid with a bendingvolley struck with the outside of his left foot from near the sideline in a Copa del Rey match against Tenerife in what was described as an “impossible goal”. 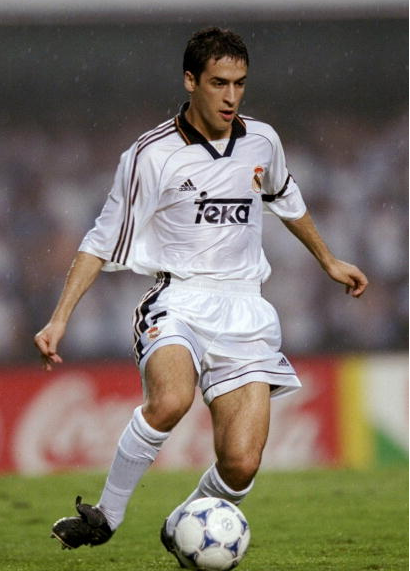 On the final day of the 2002–03 season, with Madrid needing to beat Athletic Bilbao to overtake Real Sociedad and win their 29th La Liga title, Carlos scored from a free-kick in the second minute of first half stoppage time to put los Blancos 2–1 ahead. The team eventually ran out 3–1 winners to wrap up the title. 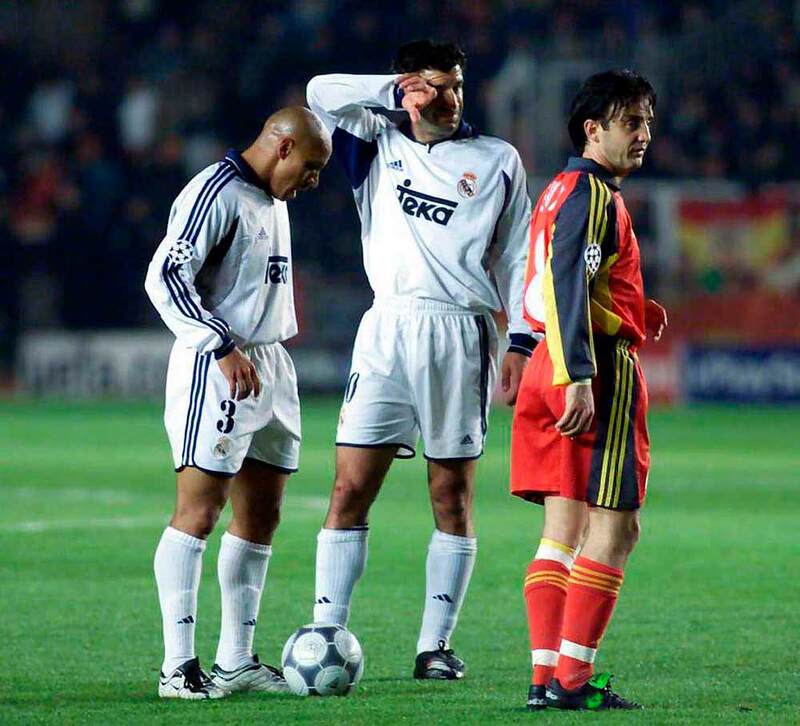 On 6 December 2003, Roberto Carlos scored the opening goal for Madrid as they beat Barcelona in El Clásico at Camp Nou for the first time in a La Liga match in 20 years. In March 2007, in the second leg of the Champions League round of 16 against Bayern Munich, Roberto Carlos failed to control the backpass when Madrid kicked off, allowing Bayern’s Hasan Salihamidžić to steal the ball and feed to Roy Makaay, who scored the quickest goal in Champions League history at 10.12 seconds. Roberto Carlos bore the brunt of criticism for that mistake which led to the team’s elimination from the Champions League, and, on 9 March 2007, he announced he would leave Real Madrid upon the expiration of his contract at the end of the 2006–07 season. 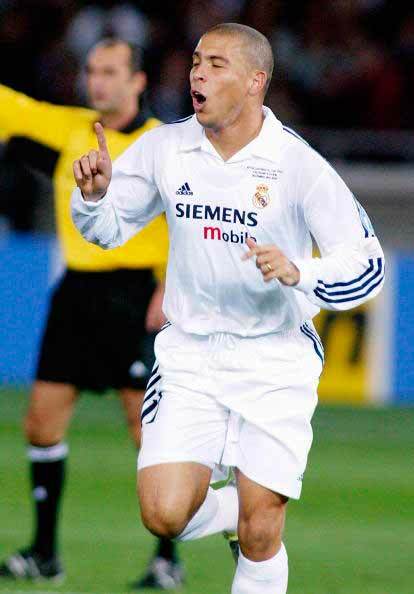 His final goal for Real Madrid was a stoppage time winner against Recreativo de Huelva with three games remaining in the 2006–07 La Liga season. The goal proved to be crucial to Real Madrid winning its 30th league title as they eventually finished level on points with Barcelona, becoming champions via the head-to-head rule. 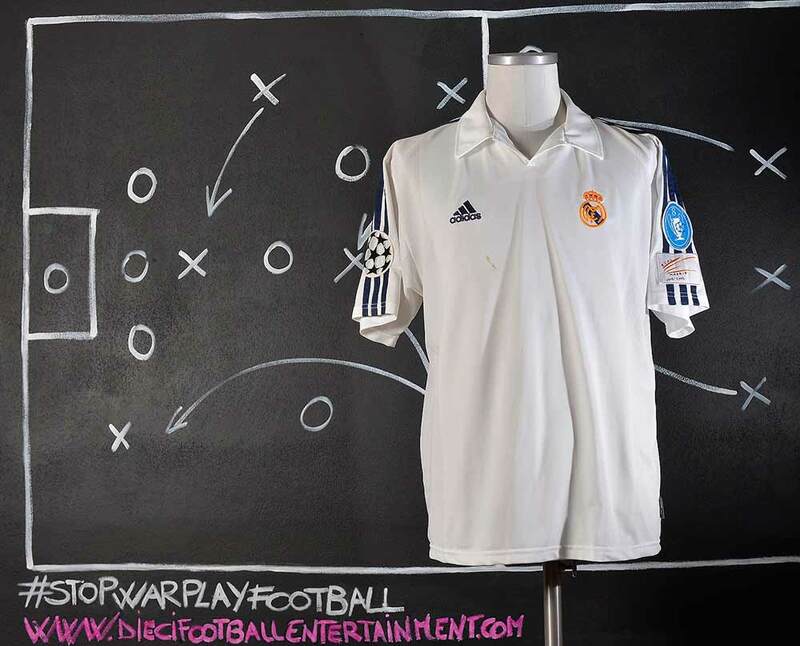 Madrid clinched La Liga in Roberto Carlos’ final match, a 3–1 win over Mallorca at the Santiago Bernabéu Stadium. 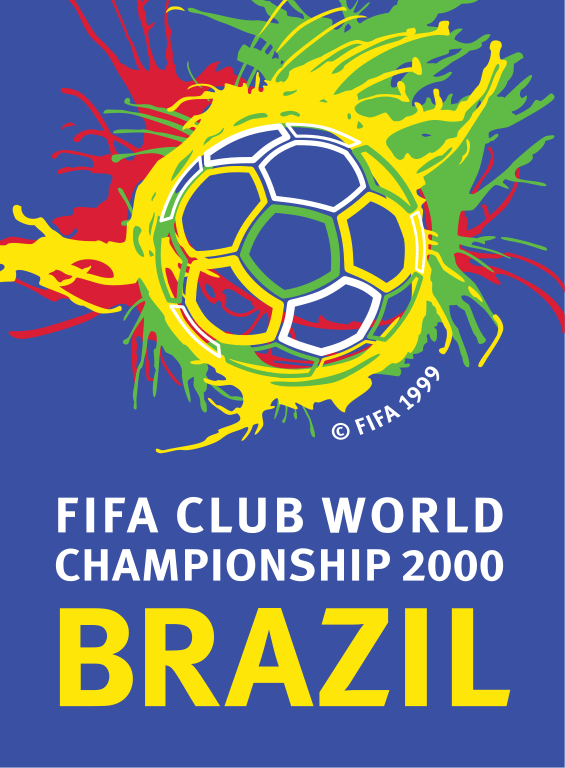 The 2000 FIFA Club World Championship was the inaugural FIFA Club World Cup, the world club championship for men’s club association football teams. 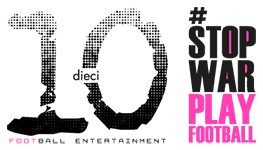 It took place in Brazil from 5 January to 14 January 2000. FIFA, football’s international governing body selected Brazil as the host nation on 3 September 1997 as the bid was found to be the strongest among a total of nine candidates. The draw was made at the Copacabana Palace in Rio de Janeiro on 14 October 1999. All matches were played in Rio de Janeiro’s Estádio do Maracanã and São Paulo’s Estádio do Morumbi. Eight teams, two from South America, two from Europe and one each from North America, Africa, Asia and Oceania entered the tournament. The first Club World Cup match took place in São Paulo, and was won by Spanish club Real Madrid, who defeated Saudi club Al-Nassr 3–1. Nicolas Anelka of France scored the first goal in Club World Cup history, while Brazilian champions Corinthians’ goalkeeper Dida posted the first official clean sheet in the tournament. Corinthians and Vasco da Gama each won their respective groups to qualify for the final. In front of a crowd of 73,000, the final finished as a 0–0 draw after extra time. The title was decided by a penalty shoot-out that Corinthians won 4–3. As winners, Corinthians received $6 million in prize money, while Vasco da Gama received $5 million. Necaxa beat Real Madrid in the third-place play-off to claim $4 million. Real Madrid received $3 million, and the other remaining teams were awarded $2.5 million. This was the season that marked the start of the Vicente del Bosque era of trophy winning at the club, having taken over from John Toshack early in the campaign. The squad was also largely different from the previous squad, with the arrival of Steve McManaman and Nicolas Anelka from the English Premier League, as well as local talents Míchel Salgado, and Iván Helguera, to support the budding young talent of Raúl, Iker Casillas, Fernando Morientes and Guti, as well as the older veterans such as Fernando Hierro and Roberto Carlos. This was the season where the club won its 28th La Liga title, having begun a new policy under a new president, Florentino Pérez, of signing the world’s greatest player for the club. Luís Figo was the arrival of the year, along with Claude Makélélé, and they helped a team of stars win the league under Vicente del Bosque, and narrowly get knocked out of defendng their Champions League title. 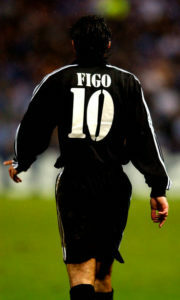 The arrival of Luís Figo in July 2000 was controversial due to Figo’s defection from FC Barcelona to Real Madrid and thus generating furious reactions from Barcelona fans. Real Madrid endured decently worst domestic league performance under Vicente del Bosque managerial, finished just 3rd in the league standings as well as Copa del Rey 2002 failure despite Real Madrid’s world record signings of Zinedine Zidane from Juventus. 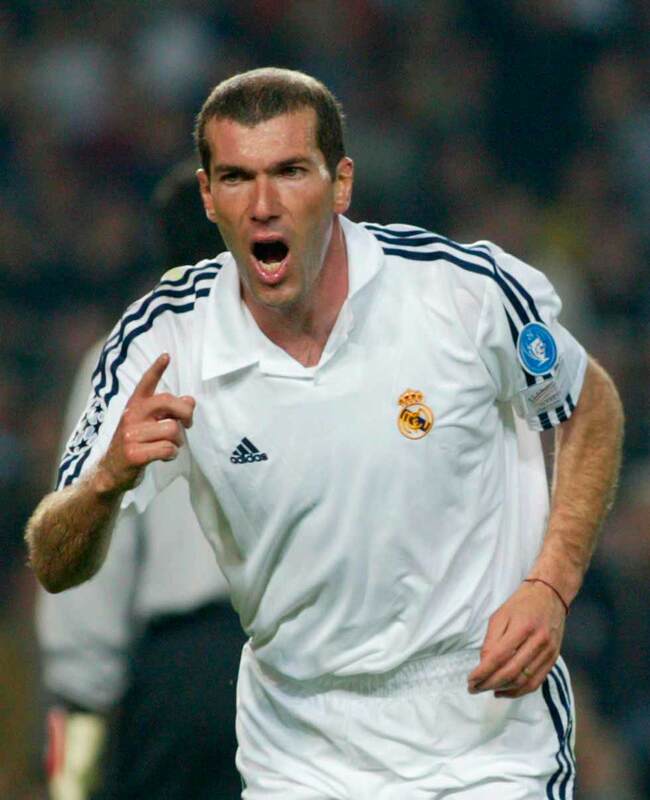 But Real Madrid’s La Novena’s UEFA Champions League title was a consolation prize, following a 2-1 victory against Bayer Leverkusen in the final thanks to Zidane’s volley goal. The 2001-2002 season was the 100th team’s Anniversary season. 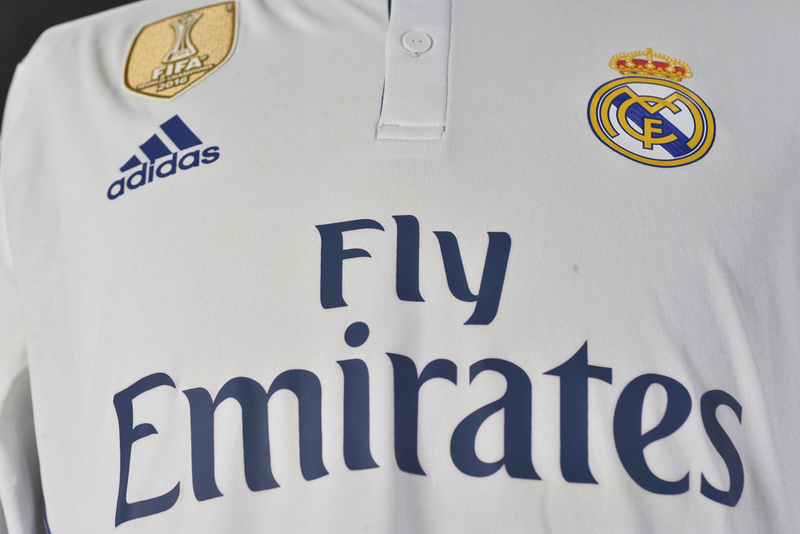 Real Madrid wore an all white shirt for the whole season, without shirt sponsorship. 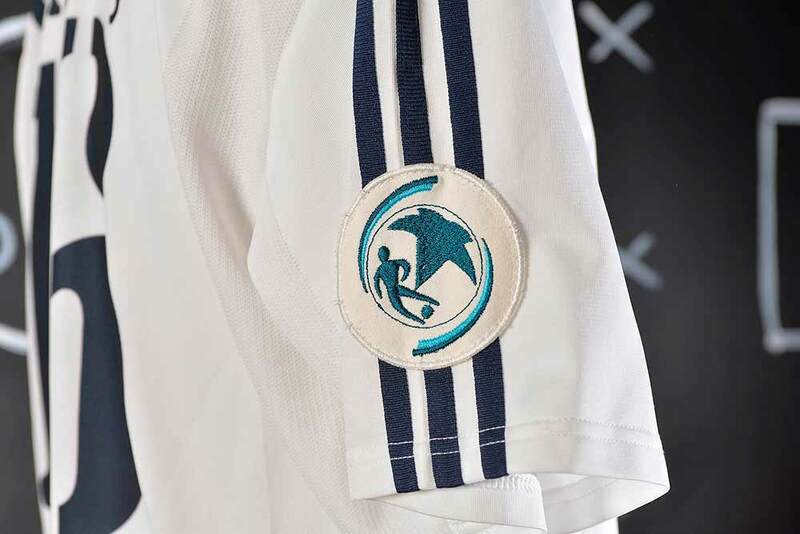 In the Champions League, the sleeves included the three stripes of Adidas in blue. 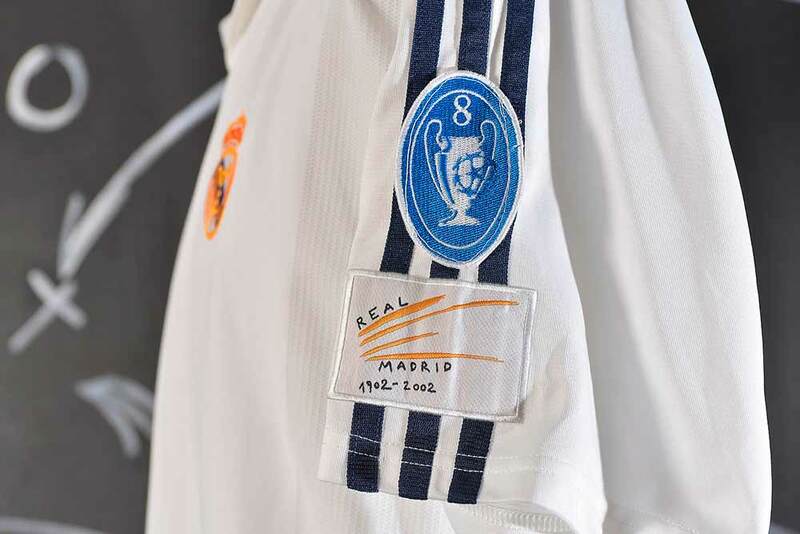 A special anniversary’s badge was embroidered on sleeve to celebrate it. 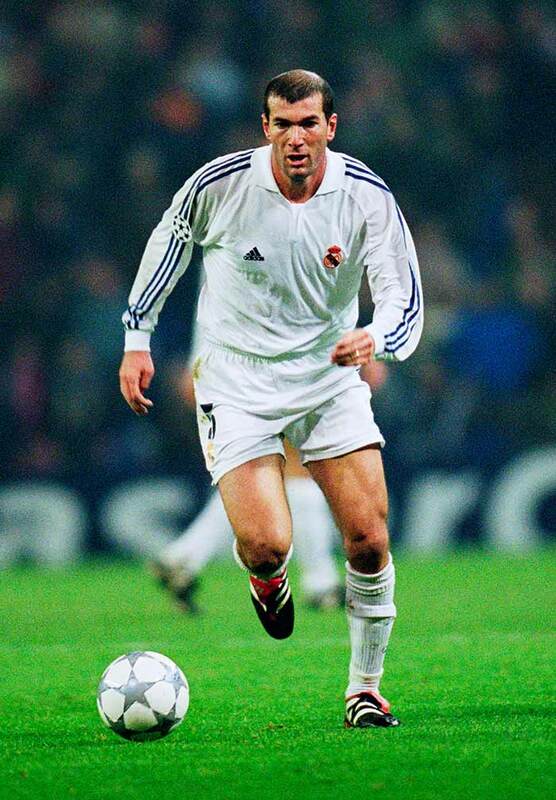 Fernando Hierro joined Real Madrid in 1989. 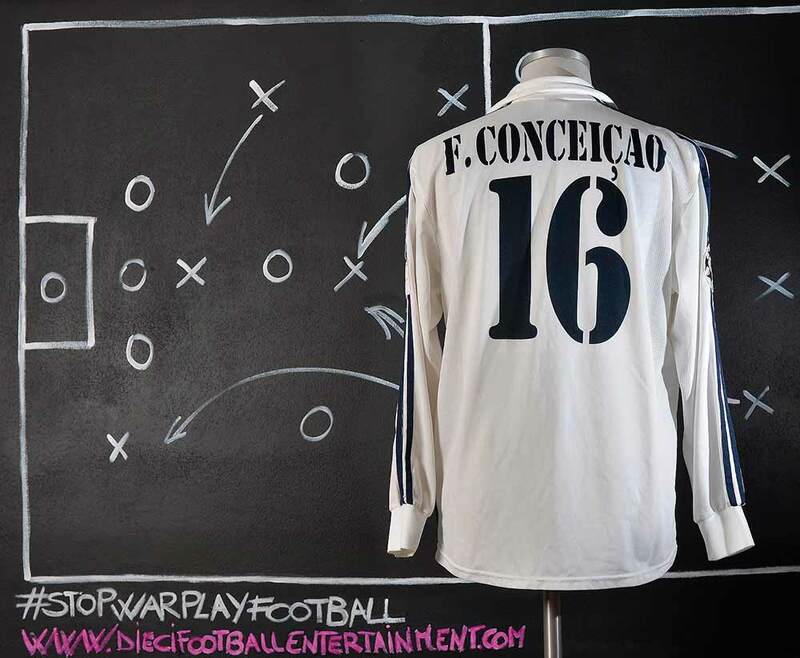 During years, he often partnered club great Manolo Sanchís in the centre of the defense, being instrumental in the conquest of five leagues and three UEFA Champions League trophies and being named captain after the latter’s retirement. He was released at the end of the 2002–03 season alongside club manager Vicente del Bosque, under rather unceremonious circumstances; having appeared in 497 top division matches over the course of 16 seasons (105 goals), he then chose a lucrative move to the wealthy but developing Middle East football industry, joining Qatar’s Al Rayyan Sports Club. Real Madrid returned to domestic league glory under Vicente del Bosque managerial after 3-1 victory against Athletic Bilbao in the season finale. But Real Madrid was surprisingly sacked Vicente del Bosque after del Bosque not offered his new contract. 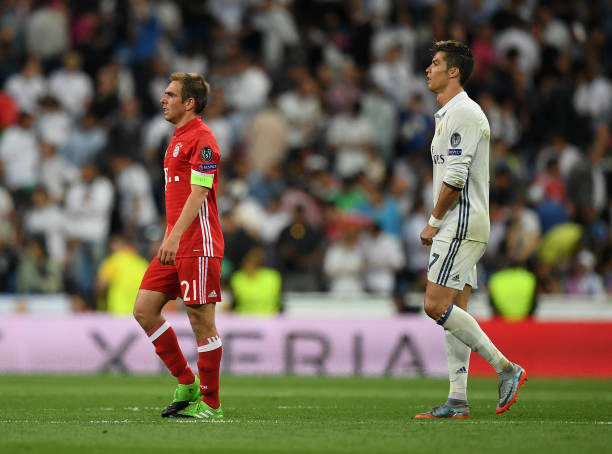 Real Madrid were also on course of retaining UEFA Champions League La Decima title before being eliminated by Italian league champions Juventus. In the domestic cup, Real Madrid were also eliminated by eventual Copa del Rey champions RCD Mallorca with 1-5 aggregate loss. 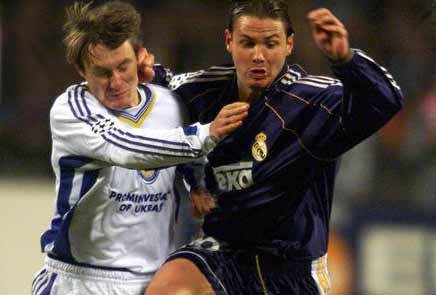 The 2002 UEFA Super Cup was played on 30 August 2002 between Real Madrid of Spain and Feyenoord of the Netherlands. 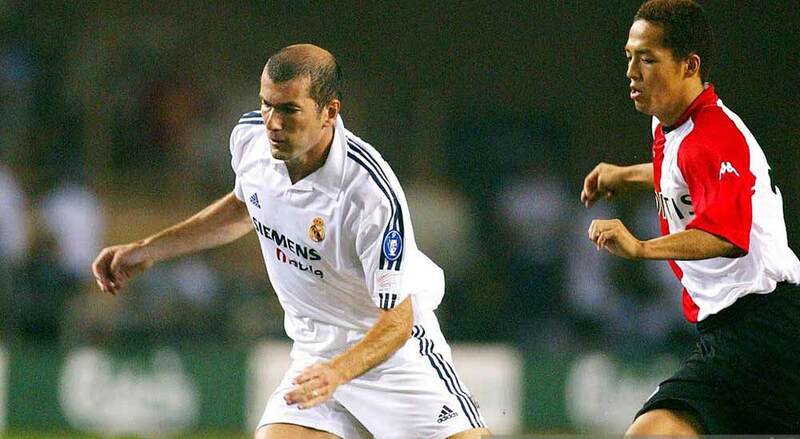 Real Madrid qualified by beating Bayer Leverkusen in the 2002 UEFA Champions League Final. Feyenoord had made it to the Super Cup after beating Borussia Dortmund in the 2002 UEFA Cup Final. Real Madrid won the match 3–1, securing their first Super Cup win. The game was played at the Stade Louis II in Monaco has been the venue for the UEFA Super Cup every year since 1998. Built in 1985, the stadium is also the home of AS Monaco, who play in the French league system. The 2002 Intercontinental Cup was a football match played on 3 December 2002, between Real Madrid of Spain, winners of the 2001–02 UEFA Champions League, and Olimpia of Paraguay, winners of the 2002 Copa Libertadores. The match was played at the neutral venue of the International Stadium Yokohama in Yokohama in front of 66,070 fans. 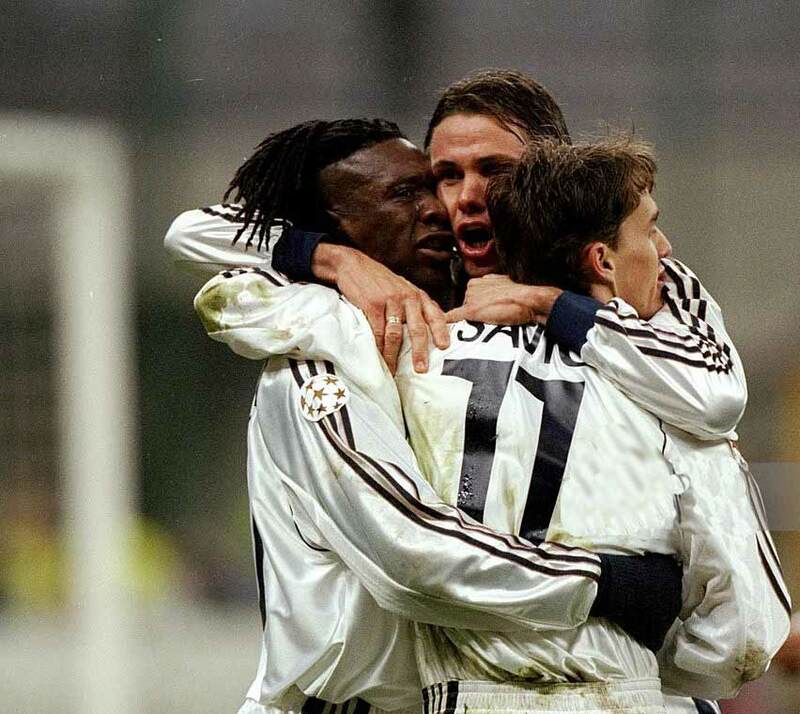 This encounter marked a special occasion for Olimpia and Real Madrid, as both teams celebrated their centenary in 2002. Ronaldo was named as man of the match. 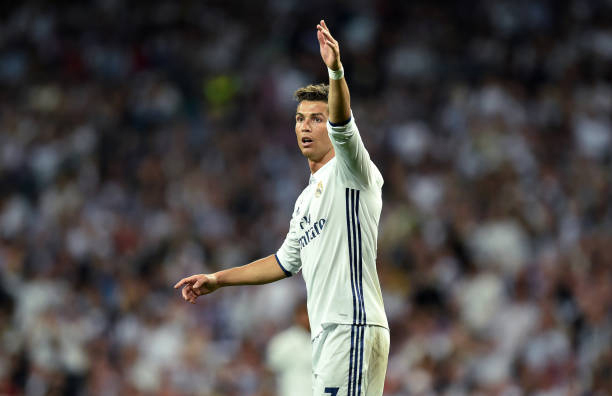 Ronaldo opened the scoring for Real Madrid in the 14th minute shooting low right footed past the goalkeeper from inside the penalty box. The second goal was scored by Guti in the 84th minute, heading home at the near post after a cross from Luís Figo on the right. 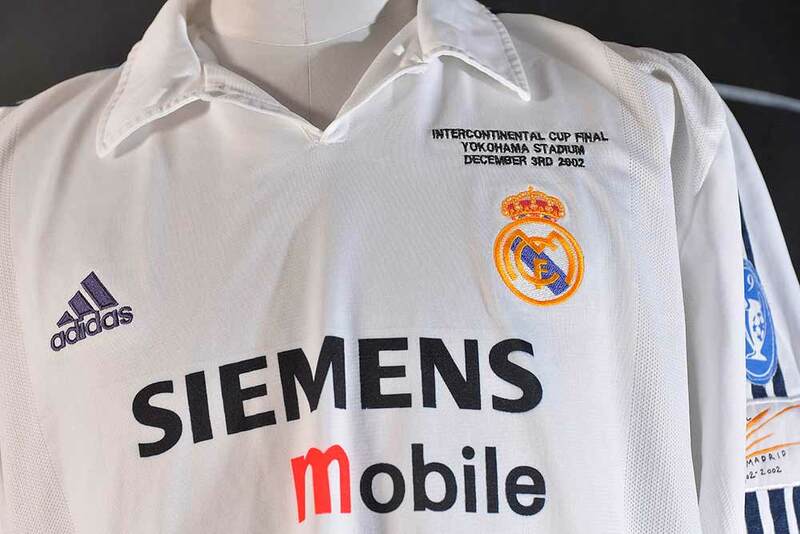 This style of shirt without sponsor was never used by the team during the season as in all of the competitions Real Madrid used SIEMENS MOBILE’s sponsor. 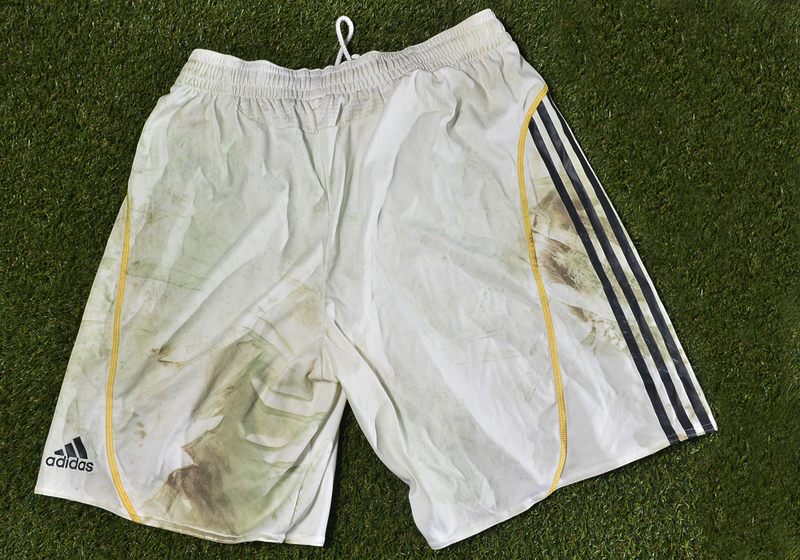 It might have been prepared for some unknown reason as it comes from the team’s kit room but we have no clue about it. After the 2006 World Cup, the Calciopoli trial verdicts relegated Juventus to Serie B, Cannavaro followed Juve manager Fabio Capello to Real Madrid. Real Madrid paid €7 million to sign him and gave him the No. 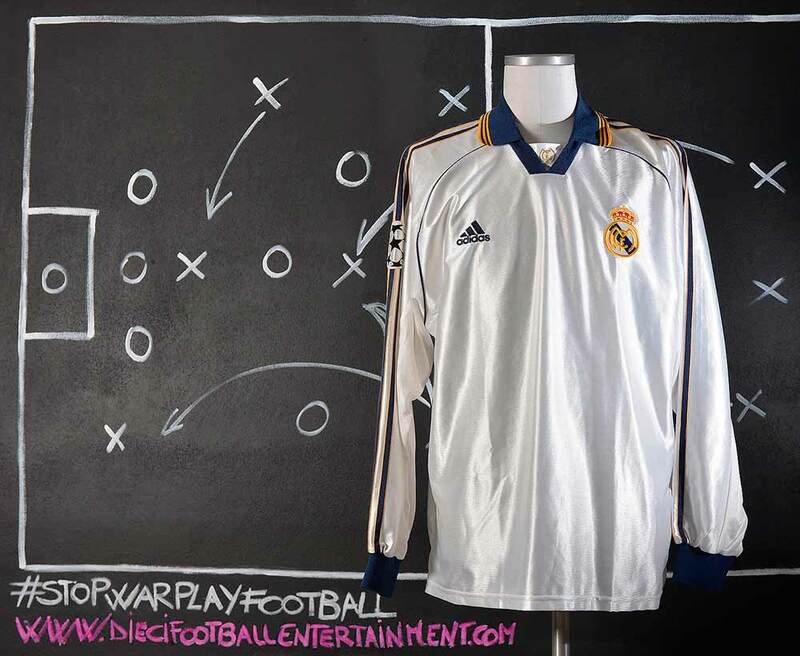 5 shirt that had previously been worn by former Madrid player and French international Zinedine Zidane. Cannavaro spent three seasons at Madrid, winning the La Liga title in 2006–07 and 2007–08, and being named the 2006 FIFA World Player of the Year, also winning the 2006 Ballon d’Or. Cannavaro was elected as part of the 2006 and the 2007 FIFPro World XI squads, and the 2006 UEFA Team of the Year. He was named in the six man shortlist for the 2007 Laureus World Sportsman of the Year. 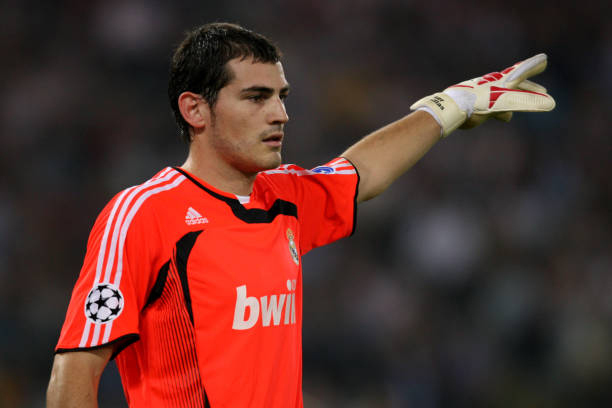 The 2007–08 season was a fruitful season for Casillas, as he helped Real Madrid reclaim their 31st La Liga title and conceded only 32 goals in 36 matches to claim the Zamora Trophy. 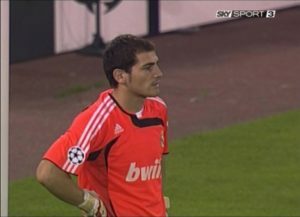 On 14 February 2008, he and club captain Raúl were awarded contracts for life; Casillas signed a contract extension that would keep him at the club until 2017, with an automatic extension if he played 30 competitive matches during the final season of the contract and a buy-out clause of £113 million. His performances earned him a spot in the UEFA Team of the Year for the second time. 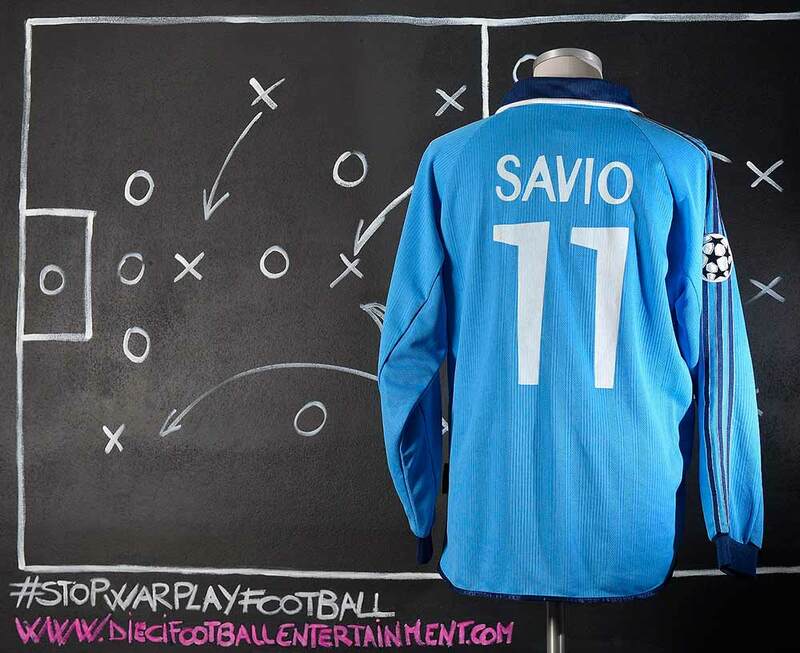 This shirt was worn by Iker Casillas against Lazio on October 3rd 2007. 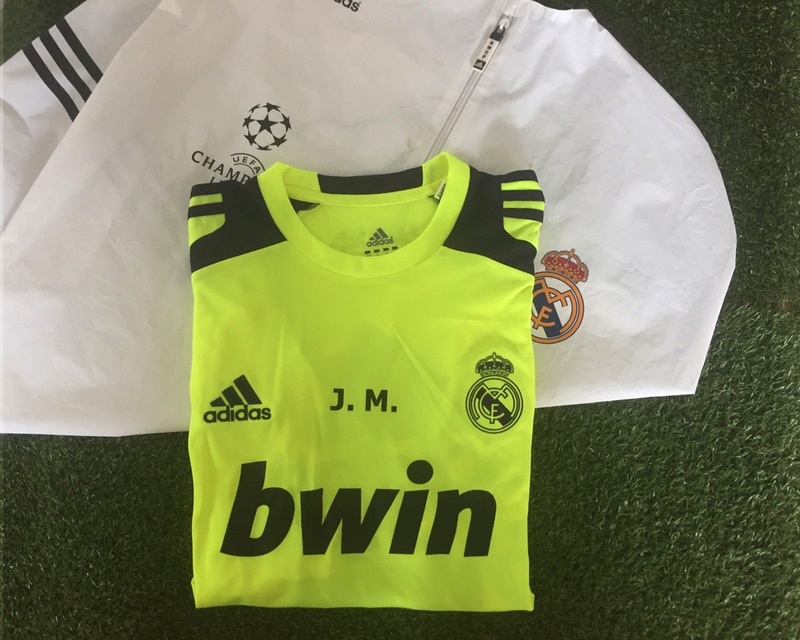 As you can see from the pictures the shirt has a very recognizable detail which is the awry sponsor on chest, that was probably a kit man’s mistake while he prepared the shirts. 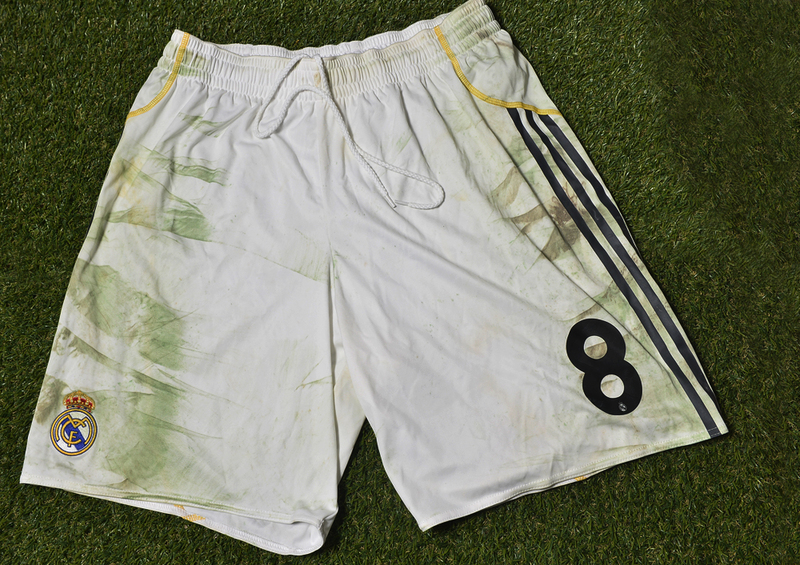 But this mistake makes this shirt very recognizable while worn by Casillas as you can see from the picture on left. On 3 June 2009, it was reported that newly elected Real Madrid president Florentino Pérez had offered to buy Kaká from Milan for a reported €68.5 million, two days after the player had left for international duty with Brazil. Milan vice-chairman and CEO Adriano Galliani confirmed that he and Kaká’s father, Bosco Leite, had traveled to Mexico to meet with La Volpe: “We had lunch and spoke about Kaká. I don’t deny it. Negotiations exist, but a deal has yet to be done.” On 4 June, Galliani told Gazzetta dello Sport that financial reasons were his motive for the talks with La Volpe: “We cannot allow [Milan] to lose €70 million … The reasons behind Kaká’s departure would be economic.” On 8 June, Milan and Real Madrid confirmed Kaká’s move to the Santiago Bernabéu Stadium on a six-year deal for €67 million fee. Kaká was unveiled as a Real Madrid player on 30 June 2009, and he made his unofficial debut on 7 August 2009 in a 5–1 friendly victory against Toronto FC. He scored his first goal for Madrid during a pre-season match on 19 August 2009, in a 5–0 victory against Borussia Dortmund. Kaká later made his league debut on 29 August 2009 in a 3–2 win against Deportivo de La Coruña. He scored his first goal, a penalty, on 23 September in a 2–0 win against Villarreal. Real Madrid finished the season as runners-up in La Liga, with Kaká scoring eight goals and providing six assists in La Liga, and nine goals and eight assists in all competitions. 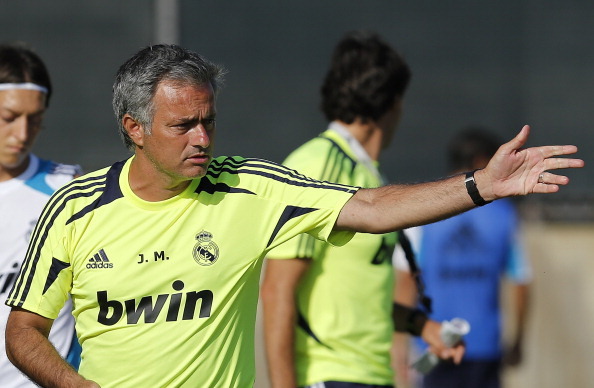 On 28 May 2010, it was confirmed that Mourinho would take over from Manuel Pellegrini at the Santiago Bernabéu Stadium. 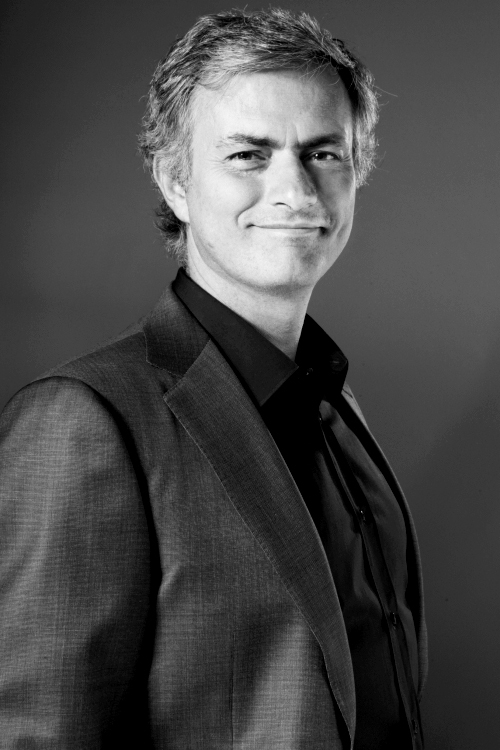 On 31 May 2010, Mourinho was unveiled as the new manager of Real Madrid after signing a four-year contract, and became the 11th manager in the past seven years at the club. 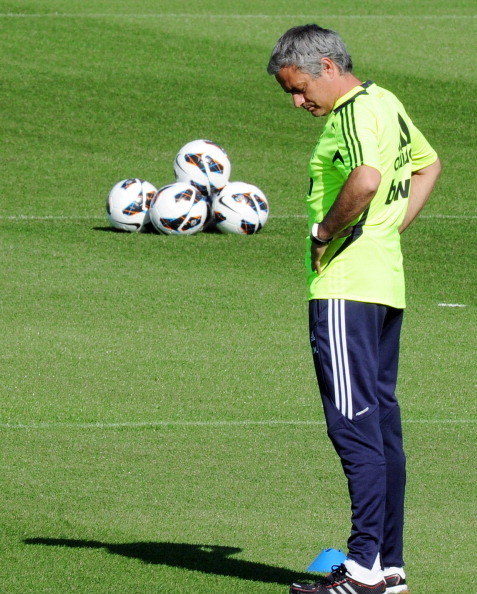 Mourinho was appointed sporting manager as well as first-team coach, and he was regarded by some as a Galáctico (a term more often used for star players instead of coaches). 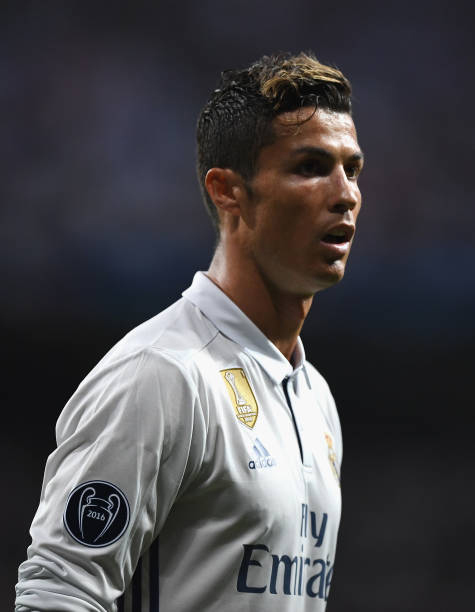 Prior to Mourinho’s arrival, Real Madrid had underperformed despite paying record transfer fees for Galácticos such as Kaká and Cristiano Ronaldo. 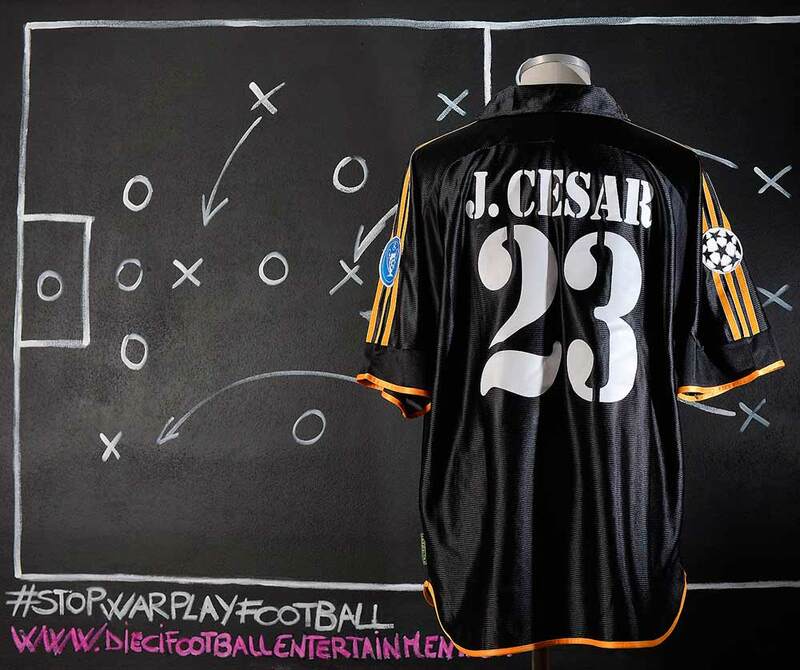 Their 2009–10 season was marked by disappointments such as Alcorconazo, a shock 2009–10 Copa del Rey round of 32 knockout by Segunda División B team Alcorcón, and elimination from the Champions League by Lyon in the round of 16, though they finished second in La Liga with a club record 96 points. By the end of the transfer window, after the 2010 FIFA World Cup, Mourinho had brought four new players to the squad: the Germans Sami Khedira (€13 million) and Mesut Özil (€15 million), Portuguese defender Ricardo Carvalho (€8 million) and Argentine winger Ángel Di María (€25 million plus €11 million on incentives). Mourinho spent three years in Madrid winning La Liga in 2011-2012, Copa del Rey in 2010-2011 and Supercopa de España in 2012. 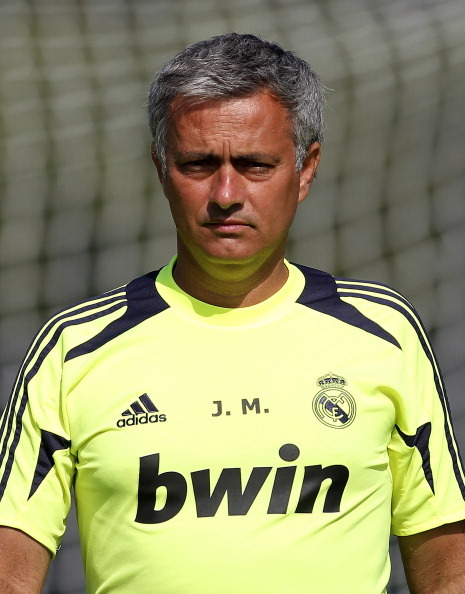 Following the 2013 Copa del Rey final loss to Atlético Madrid on 17 May, Mourinho called the 2012–13 season “the worst of my career”. Three days later, Real Madrid president Florentino Pérez announced Mourinho would leave the club at the end of the season by “mutual agreement”, a year after signing a contract extension to 2016. Between 23 February 2002 and 2 April 2011, Mourinho went 150 home league matches unbeaten: 38 (W36–D2) with Porto, 60 (W46–D14) with Chelsea, 38 (W29–D9) with Internazionale and 14 (W14–D0) with Real Madrid. The run was broken by Sporting de Gijón on 2 April 2011, when they defeated Real Madrid 1–0 at the Santiago Bernabéu in La Liga. 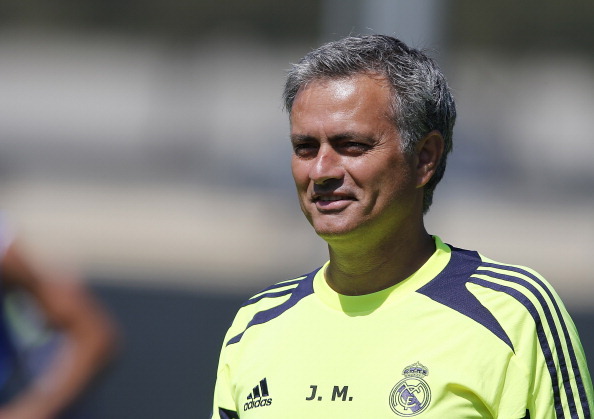 After the match, Mourinho entered Gijón’s dressing room and congratulated them. 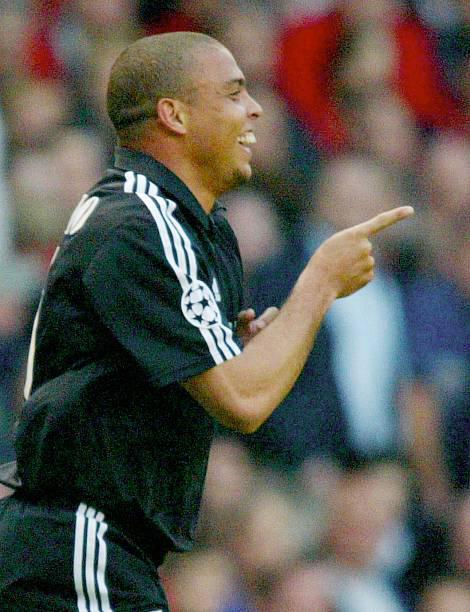 His only prior home league defeat had come when Porto lost 3–2 to Beira-Mar on 23 February 2002. Mourinho underwent a 45 home league matches unbeaten streak: 31 (W27–D4) with Real Madrid and 14 (W13–D1) with Chelsea. This streak was ended on 19 April 2014, when Chelsea lost 2–1 to Sunderland. 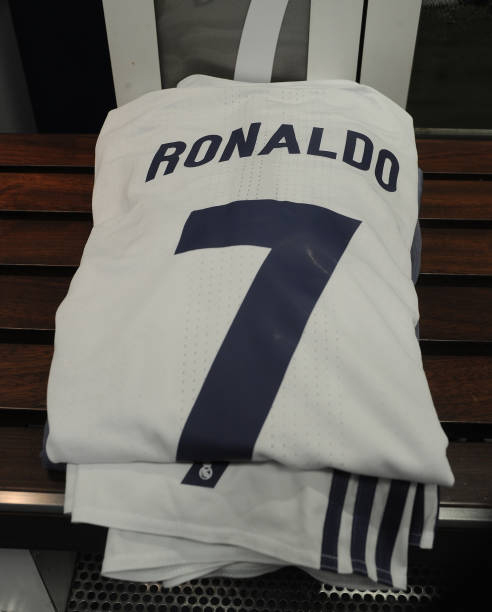 Following the 2012–13 winter break, Ronaldo captained Real Madrid for the first time in an official match, scoring a brace to lift 10-man Madrid to a 4–3 victory over Real Sociedad on 6 January. He subsequently became the first non-Spanish player in 60 years to captain Madrid in El Clásico on 30 January, a match which also marked his 500th club appearance. Three days prior, he had scored his 300th club goal as part of a perfect hat-trick against Getafe. 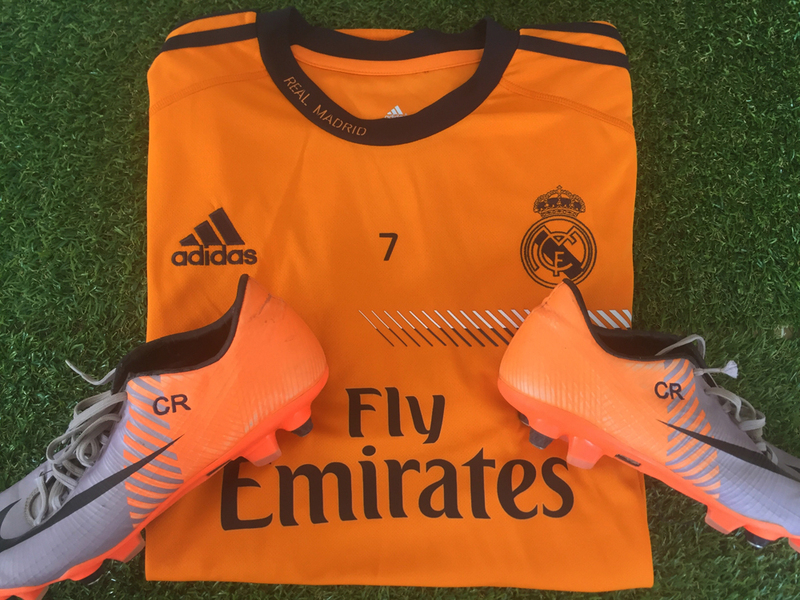 Following hat-tricks against Celta Vigo and Sevilla, he scored his 200th goal for Real Madrid on 8 May in a 6–2 win against Málaga, reaching the landmark in just 197 games. He helped Madrid reach the Copa del Rey final by scoring a brace in El Clásico, which marked the sixth successive match at Camp Nou in which he had scored, a scoring streak twice as long as that of any other player in Madrid’s history. In the final, he headed the opening goal of an eventual 2–1 defeat to Atlético Madrid, but was shown a straight red card in the 114th minute for violent conduct. Real Madrid also failed to defend their La Liga title, finishing runners up to Barcelona. He ended 2013 with a total of 69 goals in 59 appearances, his highest year-end goal tally. His efforts earned him the FIFA Ballon d’Or, an amalgamation of the Ballon d’Or and the FIFA World Player of the Year award, for the first time in his career, though the media vote favored Franck Ribéry. 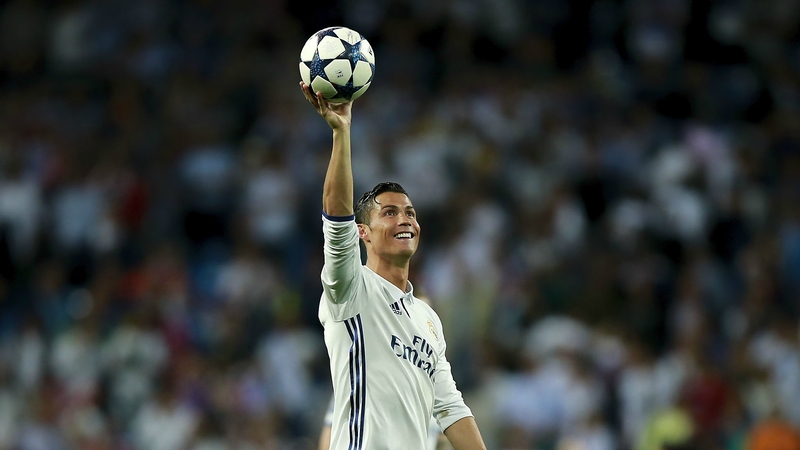 The achievement fueled public recognition of Ronaldo as one of the greatest players in football history. 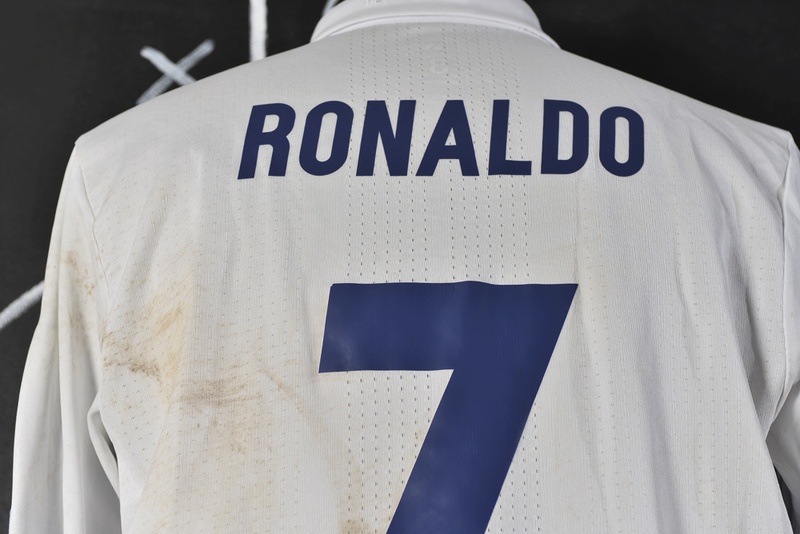 Concurrently with his individual achievements, Ronaldo enjoyed his greatest team success in Spain to date, as he helped Real Madrid win La Décima, their tenth European Cup. 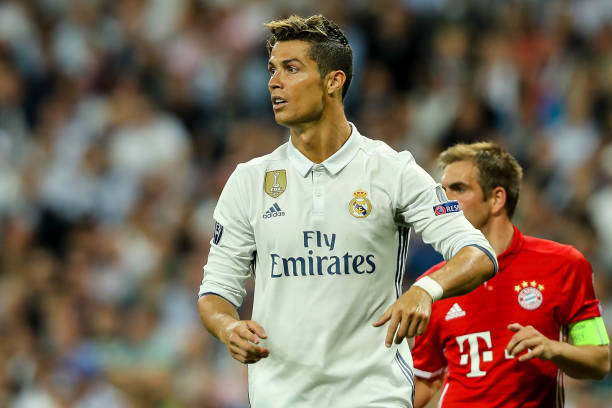 Ronaldo played the final against medical advice, later commenting: “In your life you do not win without sacrifices and you must take risks.” As the Champions League top goalscorer for the third time, with a record 17 goals, he was named the UEFA Best Player in Europe. 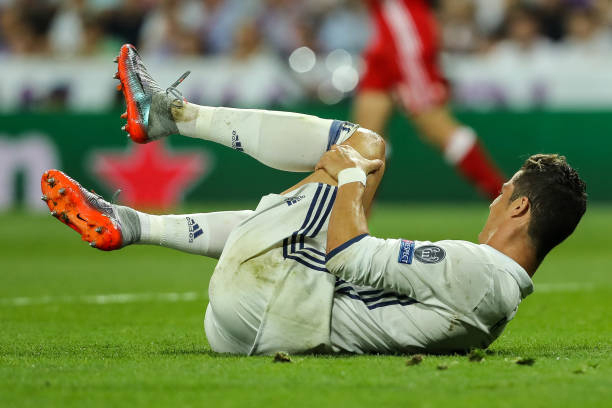 Ronaldo missed Real Madrid’s first three matches of the 2016–17 season, including the 2016 UEFA Super Cup against Sevilla, as he continued to rehabilitate the knee injury he suffered against France in the final of Euro 2016. On 15 September, Ronaldo did not celebrate his late free kick equaliser against Sporting CP in the Champions League, with Ronaldo stating post match, “they made me who I am.” On 6 November, Ronaldo signed a new contract set to keep him with Madrid until 2021. On 19 November, he scored a hat-trick in a 3–0 away win against Atlético Madrid, making him the all-time top scorer in the Madrid derby with 18 goals. On 15 December, Ronaldo scored his 500th club career goal in the 2–0 victory over Club América in the semi-finals of the FIFA Club World Cup. He then scored a hat-trick in the 4–2 win over Japanese club Kashima Antlers in the final. Ronaldo finished the tournament as top scorer with four goals and was also named the best player of the tournament. He won the Ballon d’Or for a fourth time and the inaugural Best FIFA Men’s Player, a revival of the former FIFA World Player of the Year, largely owing to his success with Portugal in winning Euro 2016. 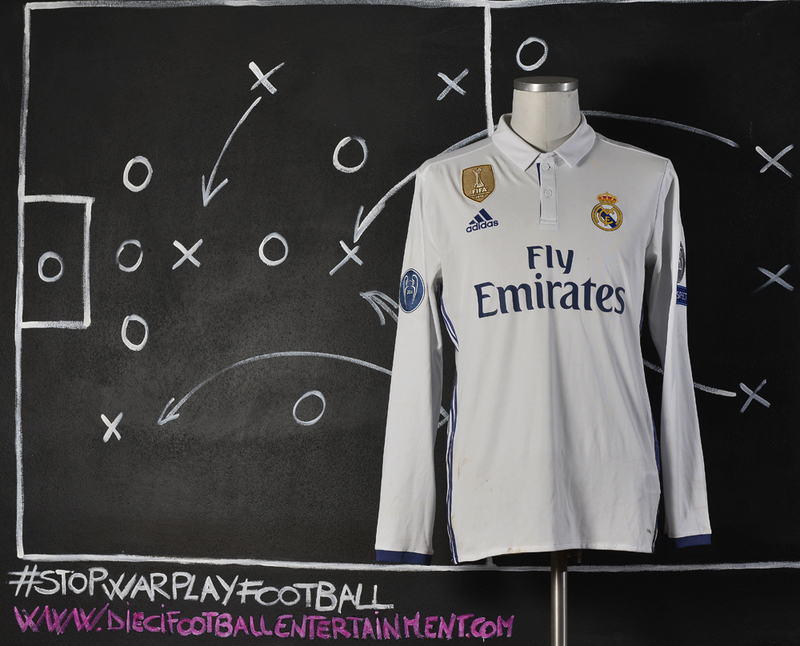 This shirt has been worn by Cristiano Ronaldo during the Champions League game Real Madrid vs Bayern Munich which took place in Madrid on April 18th 2017. 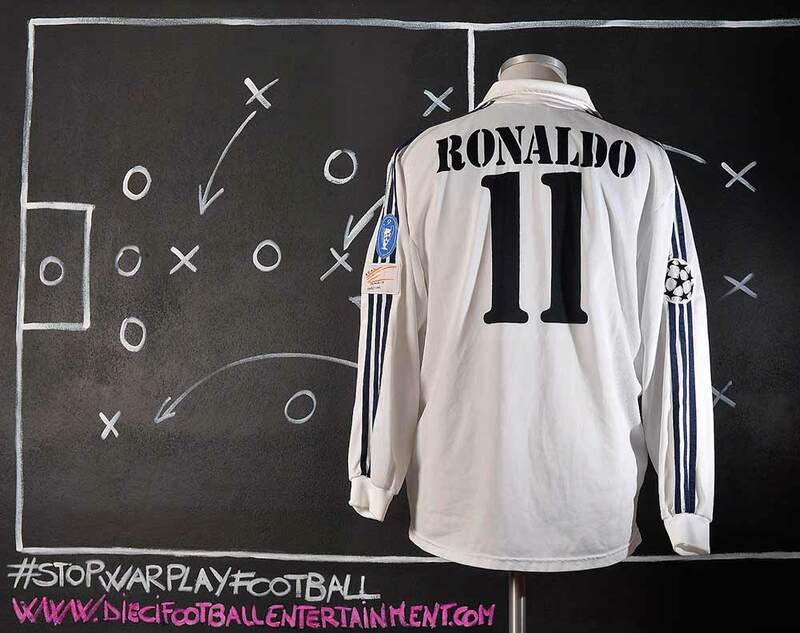 Real Madrid worn 4-2 and Ronaldo scored an hat-trick in a match that will be remembered as a very controversial game. Bayern Munich have been done over by some awful officiating by referee Viktor Kassai and his assistants. They were well on top when Arturo Vidal was incorrectly sent off near the end of normal time. Vidal’s dismissal was compounded by Ronaldo scoring two offside goals in extra-time. 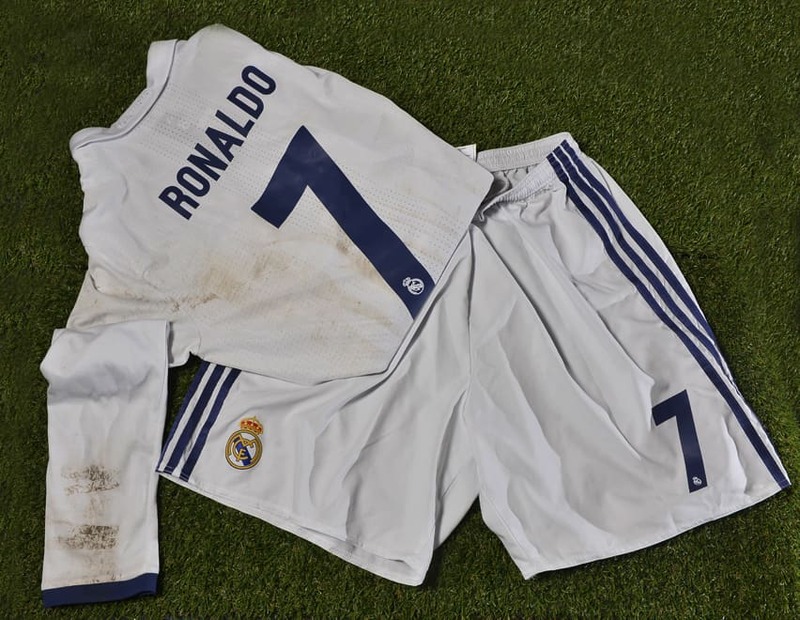 The shirt was worn by Ronaldo in the first half of the game and swapped with Bayern Munich player Xabi Alonso. The shirt got really stained in the back due some takedowns occurred to Cristiano. The big stains in the back are due a takedown happened in the last two minutes of the first half as you can see from the video at the bottom.